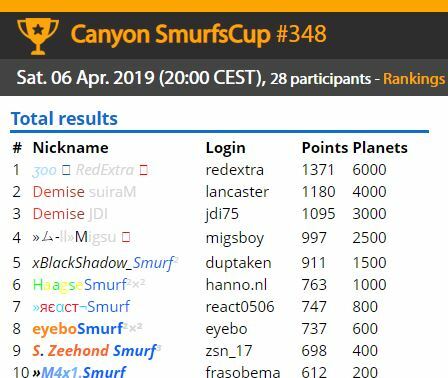 Hope to cu TONIGHT at 20.00 CEST at the Smurfscup Canyon (06-04-2019) and have fun!! Tonights hopefully again crowded Smurfscup will probably end approximately at 21.00 CEST. That will give you enough time to join the MX KO at 21.30 CEST which will be special as always ! Tonights MX KO will be held in MULTI-ENVI. So prepare yourself for a racing Saturday evening and have fun!!!! The United TMX Knockout will take place EACH FRIDAY at 22.00 CEST. 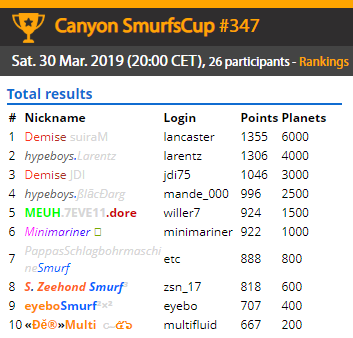 Hope to cu TONIGHT at 20.00 CEST at the Smurfscup Canyon (13-04-2019) and have fun!! 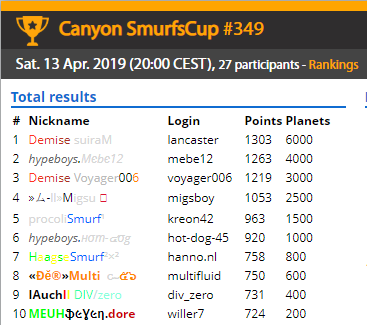 Hope to cu TONIGHT at 20.00 CEST at the Smurfscup Canyon (20-04-2019) and have fun! !